If you are buying a second home in France, the chances are you intend to travel a lot between England and France during the course of a year, and you’ll be wanting to take your car. So which ferry operators run crossings between the two countries, what onboard services do they offer, what are their facilities for the disabled, and how easy is it to travel with pets? 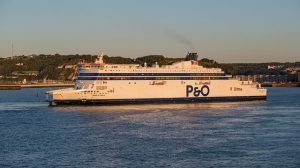 There are four operators currently running ferry services between England and France. They are Brittany Ferries, Condor Ferries, DFDS Seaways and P&O Ferries, and they currently connect five ports in England: Dover, Folkestone, Newhaven, Plymouth and Poole, with eight ports in France: Caen, Calais, Cherbourg, Dieppe, Dunkirk, Le Havre, Roscoff and St Malo. DFDS is a Danish shipping company that operates passenger and freight services across northern Europe. They also offer mini cruises, holidays and group travel for special occasions or school trips, and their regular offers include Dover to France multi-tickets, Nectar points, short breaks and discounts of up to 20% for the over-60s. Onboard all DFDS ferries are self-service restaurants serving breakfast, main meals and snacks, and shops selling newspapers and magazines, travel accessories, gifts and souvenirs, toys, games, perfumes and cosmetics, and a selection of beers, wines, spirits and tobacco products. There are also soft play areas for younger children, and video games and cartoons for older children. Grown-ups can enjoy sundeck areas and quiet lounge areas with reclining seats. For an extra charge it’s possible to rent private cabins, with either two or four bunks, an en suite shower and WC. The World Travel Awards have named DFDS as Europe’s Leading Ferry Operator 2012-2018 and the World’s Leading Ferry Operator 2011-2017. Both ships were both fully refurbished in 2016 and can accommodate 1,500 passengers and 400 cars, with a cruising speed of 25 Knots. Facilities for passengers with reduced mobility include a passenger lift measuring 130cm x 158cm, entrance doors of width 90cm, one wheelchair-accessible public lavatory, and lift access parking​. Built in 1991 and extensively refurbished in 2017, this vessel can accommodate 2,000 passengers and 600 cars, and has a cruising speed of 21 Knots. Facilities for passengers with reduced mobility include one passenger lift measuring 190cm x 220cm, cabins with entrance doors 120cm wide, bathrooms equipped with hand rails, one wheelchair-accessible public lavatory and lift access parking. These three sister ships were built in 2005 and are of Scandinavian design with a light and airy atmosphere. They can accommodate 1,000 passengers and 250 cars, and have a cruising speed of 20.5 Knots. Facilities for passengers with reduced mobility include three passenger lifts measuring 100cm x 138cm, entrance doors of 90cm width, two wheelchair-accessible public lavatories, and lift access parking. Built in 2005 and 2006, these sister ships are owned by Transmanche Ferries and operated by DFDS. Facilities for passengers with reduced mobility include two passenger lifts measuring 130 x 140cm, wheelchair-accessible public lavatories, two-berth disabled cabins with telephone/alarm: berths at ground level with hand rails in the bathrooms and 90cm wide cabin doors, as well as disabled access available on/off ship. Established in the 1960s, P&O Ferries have a fleet of some twenty passenger and freight ships, operating between England and France, the Netherlands and Ireland. Both foot and vehicle passengers are catered for, with flexible tickets and season tickets available for frequent travellers. All ships offer onboard refreshments, and shopping, with up to 20% discounts. For an additional fee there is a Club Lounge, and priority boarding is also possible. Brittany Ferries is a French shipping company, founded in 1972, that operates a fleet of ferry and cruise ships sailing between France and the UK, Ireland and Spain. They have seven cruise ferries and a high-speed ferry service, and offer spacious accommodation, à la carte and self-service restaurants, shops offering wines, spirits, tobacco, perfumes, clothing, cosmetics and accessories, and live entertainment, including children’s entertainment. Certain ships even offer virtual reality deep sea dives, video games and 3D printing, while all offer free wifi onboard. All cruise ferries have wheelchair access, lifts, wheelchair accessible cabins and some braille signage, but some passengers may find the high speed catamaran more challenging. Brittany Ferries were voted Best Ferry Operator at the Telegraph Travel Awards 2016. This is Brittany Ferries’ flagship and largest cruise ferry which carries up to 2,400 passengers and 650 cars. The ship boasts a pool and leisure area, a wrap-around promenade for deck strolls, an à la carte restaurant, cocktail piano bar and 2-storey lounge bar and entertainment area, as well as a spa. There are 650 cabins – all of which are en-suite and air conditioned – plus a number of reserved lounge seats. There are also a number of cabins adapted for disabled passengers. Introduced in 2009, this cruise ferry carries up to 1,500 passengers and 470 cars, and has been decorated to reflect the Brittany region. There is a self-service restaurant, a cafe, a quiet zone, and a choice of 247 cabins – all of which are en-suite and air conditioned – plus a number of reserved lounge seats. There are also a number of cabins adapted for disabled passengers. Launched in 1992, the Barfleur operates a daily day-time crossing from Poole and a early evening cruise back from Cherbourg, and is named after a picturesque fishing village in Normandy. Smaller than the rest of the fleet, it can carry up to 900 passengers and 590 cars, with en suite cabin accommodation with or without porthole, a self-service restaurant, bar and reserved seats lounge. This ship can accommodate 2056 passengers and 580 cars and offers dining, shopping and live entertainment. The ship carries up to 2,200 passengers and 800 cars, and offers passengers spacious cabins, a choice of restaurants, and facilities including bars, cinemas, a disco club and video gaming area designed specifically for teenagers. This ship was launched in 1991 and is decorated in traditional Norman style. It carries 2123 passengers and 600 cars, and its onboard activities include dining, shopping and live entertainment. A high-speed catamaran with speeds of up to 42 knots, which carries up to 843 passengers and 235 cars. Onboard facilities include comfortable seating, various dining options, a shop and viewing deck. These no-frills ships offer a simple but comfortable service, with limited seating areas, self-service restaurants, a small bar and a boutique each and ensuite cabins, as well as two well-equipped cabins for the disabled. Both ships have pet-friendly cabins and dedicated pet exercising areas. Mostly known for operating ferry services linking the Channel Islands with Poole, Portsmouth and St Malo, Condor Ferries also run high-speed services between Poole and St Malo, which involve a change of ferry at either Jersey or Guernsey. The high-speed trimaron Condor Liberation takes passengers from Poole to the Channel Islands, where they disembark to take the Condor Rapide on to St Malo. The Condor Rapide operates seasonally, generally between April and October, and has space for 740 passengers and 175 cars. It offers a choice of reclining seats and cabins, with an Ocean Club at an additional fee, offering leather seats, steward service and complimentary teas and coffees. There is a bistro selling hot and cold snacks, with vegetarian and gluten-free options, and an Ocean Bar for drinks and snacks. The duty free shops sells alcohol, tobacco, cosmetics, fashion accessories and confectionery. There is also a children’s TV room. For disabled passengers, there are designated parking spaces, and specially adapted buggies and buses for foot passengers. Seating is available on the lower tier and the Ocean Club is wheelchair accessible. There are also disabled lavatories. All these crossings may be booked directly through the sailing companies, or through specific bookings websites, such as Direct Ferries, A Ferry or Ferry Savers. DFDS provides safe transportation for pets onboard their ferries, with owners having the opportunity to visit their pets during longer crossings, by arrangement with a member of onboard staff. They even accept unaccompanied pets travelling with a signed declaration and a specific health certificate. 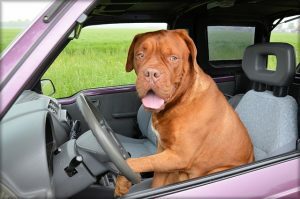 P&O Ferries allow dogs, cats and ferrets on their ships, but they must stay in the vehicle during the trip. 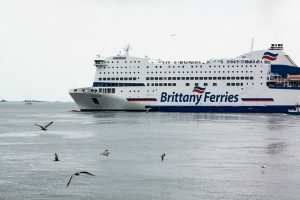 Most of the Brittany Ferries fleet requires that pets remain in the vehicle, with two exceptions: the Baie de Seine, travelling between Portsmouth and Le Havre, has fourteen pet-friendly cabins and a dedicated pet exercise area; and the Etretat, which also sails to Le Havre from Portsmouth, has 13 pet friendly cabins and a small exercise area. On the Bretagne and the Pont-Aven, there are small and large kennels which are accessible at all times with a swipe card, and small exercise areas. Dogs must be muzzled at all times. Registered assistance dogs may travel in cabins and other public areas of the ship. Condor Ferries also require pets to remain in their vehicles, with visits to the car deck during the journey permitted, accompanied by a member of the ship’s crew. Pets belonging to foot passengers need to be in an RSPCA approved carrier, and kept in a dedicated pet area on the car deck. Certified assistance/sensing dogs are allowed into the passenger lounges. An alternative to ferry travel is EuroTunnel, the shuttle rail service which carries cars. They operate up to 76 crossings a day between Folkestone and Calais and the journey lasts just 35 minutes. 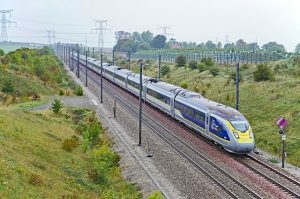 Regarded as the most environmentally-friendly way of travelling across the channel, there are four services an hour, accepting up to nine passengers per car with unlimited baggage. Pets are also welcome, and there is an exercise area at the terminal. The ideal alternative, especially for those who suffer from sea sickness!